Mat cutters are useful for the artist, craft guru, business owner, and student alike. 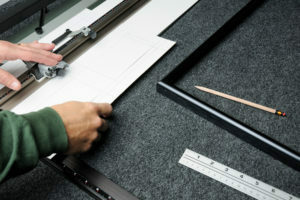 Whether you’re fitting artwork for framing or cutting strips of paper for crafts, a good mat cutter can be really beneficial for your art studio or office. Note the word “good” though; you definitely don’t want to spend your hard-earned cash on a flimsy mat cutter that breaks after a couple uses. Mat cutters are very expensive, so you want to make sure you invest in something durable and worth the investment! You’re going to see mostly products from Logan on this list, and that is because this brand is simply the best for mat cutters. They’ve got quality products ranging from high-end to cheap, from desktop to handheld. Are you ready to see some handy dandy products? Read on to check out our list of the 4 best mat cutters for all of your paper cutting needs!